It isn’t a secret that a pencil skirt is a must-have item for all women. 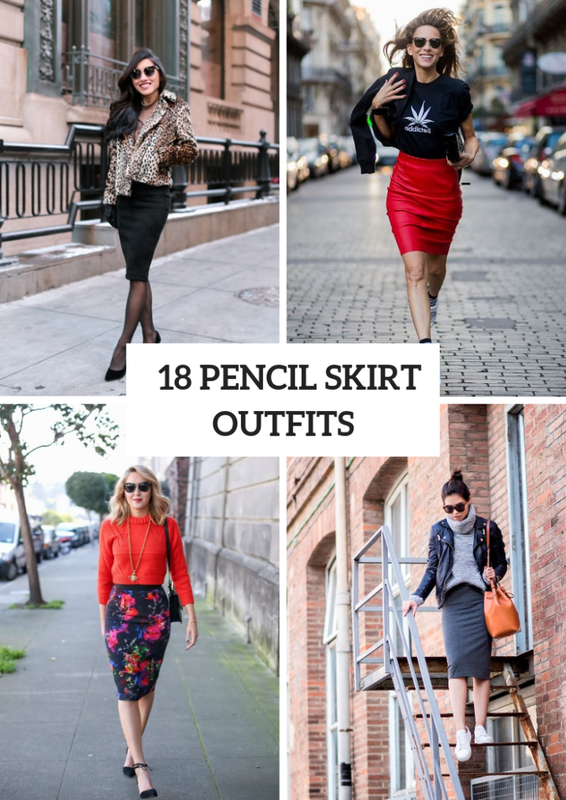 And, I’m sure, you already have at least one pencil skirt (or maybe more than one), so today I offer you to take a look at various ideas with these skirts for fall days and refresh your outfits. At first, you need to decide on the style that you want to create, for example, for sporty outfits you can mix a knee-length pencil skirt with a loose t-shirt, sneakers and a bomber jacket and for elegant looks you can choose a black midi skirt, a button down shirt, a sweater and high heels. Now you should scroll down to consider all ideas. Find a perfect one just for you! If you want to make a casual outfit, then sneakers are the best choice! For example, you can take a gray turtleneck loose sweater and combine it with a black leather jacket, a dark gray midi pencil skirt, oversized sunglasses, a brown tote and white sneakers. Or you can choose a beige cowl neck sweater and mix it with a black leather pencil skirt, white sneakers and a blue metallic small clutch. If you are looking for a more official outfit, then try to repeat a combination with a white button down shirt, a gray sweater, a black knee-length skirt, black lace up flat boots and a black leather bag. Wanna something flirty? Then take an eye-catching red sweater and combine it with a floral pencil skirt, black ankle strap high heels, sunglasses, a necklace and a black leather bag. Or you can choose a light blue crop sweater and pair it with a white high-waisted pencil skirt, a black and white clutch and black pumps.